Lana Pettey started training dogs at the age of 13. She started teaching obedience classes in 1977 and began competing in obedience trials, both AKC (American Kennel Club) and UKC (United Kennel Club). 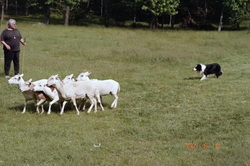 Her dogs won many first-place ribbons including several "High in Trial" awards. Over the years, she has owned and trained a diverse variety of breeds of dogs ranging from Golden Retrievers, Rottweilers, Dobermans, Poodles, Shetland Sheepdogs, Greyhounds and American Eskimo Dogs. She learned that different dogs respond better to different training styles. She has written training articles for newspapers and magazines including Dog Fancy magazine and a weekly Pet Column for The Haverhill Gazette.